Today the Advent readings place special emphasis on the joyous anticipation of the Lord’s coming. It is "Gaudete Sunday" or "Rejoicing Sunday; the Church is rejoicing. The opening antiphon of today’s Mass encourages us to, "Rejoice in the Lord always; again I say, rejoice." Isaiah encourages us to be open to and aware that it is the Spirit of the Lord that is upon us. For he has anointed us from the beginning of our Christian journey to be witnesses, to be a presence and a voice to the poor, the marginalized, the hospitalized, to the prisoners and to the broken-hearted. The second reading from Thessalonians urges us not to be timid, but to be joyful with each other and the world, and to be of constant prayer. We’re called to allow the spirit of Jesus to help us be thankful in all circumstances, giving the spirit enough space to work within us. There is much comfort knowing that the one who has called us is faithful, and that he will accomplish his will in us, even in the middle of all the messes we experience in life. 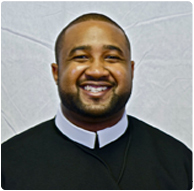 Ashford St. Romain, C.Ss.R., professed his first vows as a Redemptorist in August 2011. He is a fourth-year philosophy student at St. John’s University in New York, NY, and is a member of the Redemptorist formation community at Immaculate Conception Church in the Bronx, NY.